In between a busy couple of weeks where my current client project has reached a critical stage, I’ve not had time to do much outdoors and with miserable weather and feeling shattered from work, not much inclination either. But one thing has been drifting in and out of my thoughts – my project to complete the Wainwrights. I keep coming across little reminders that have kept this in my thoughts, so let me share a few with you. It was on 9 November 1952 that Alfred Wainwright started work on his Pictorial Guides, and I know that this weekend there are a few commemorative walks taking place. Now AW didn’t drive but I thought nothing of this until recently. He used buses and got lifts in order to complete his walks. I’d got to over half way in my Wainwright round before I realised that I’d already done most of my walks in a similar fashion, and I decided then that I would make my Wainwright round more special by banning the use of a car. Henceforth my round wouldn’t be considered fully complete until every one of the 214 fells had been done without using a car. Only local buses, boats and trains would be allowed. I’m not doing this to prove any particular point – although clearly it will show that a car is not necessary to do the Wainwrights – but more in recognition of the fact that it is quite possible that I will only complete one full round, and if so I might as well make it special in as many ways as possible. I was reading Tanya’s piece in the latest issue of TGO (page 112 if you’re interested) and two things she said struck a chord. First up was her point that completing the Wainwrights was no mean feat for someone who lives in Sussex. Living in the south east too, I fully appreciate what she’s saying – it’s just too far to routinely pop up to the Lake District each weekend like those that do live in the north. Lake District trips for me, and I believe for Tanya before her incredibly jammy move there earlier this year, were a case of a few times a year that had to be planned in advance to fit in with work. Consequently, I’ve never managed to get to the Lakes more than 3 times in one year. 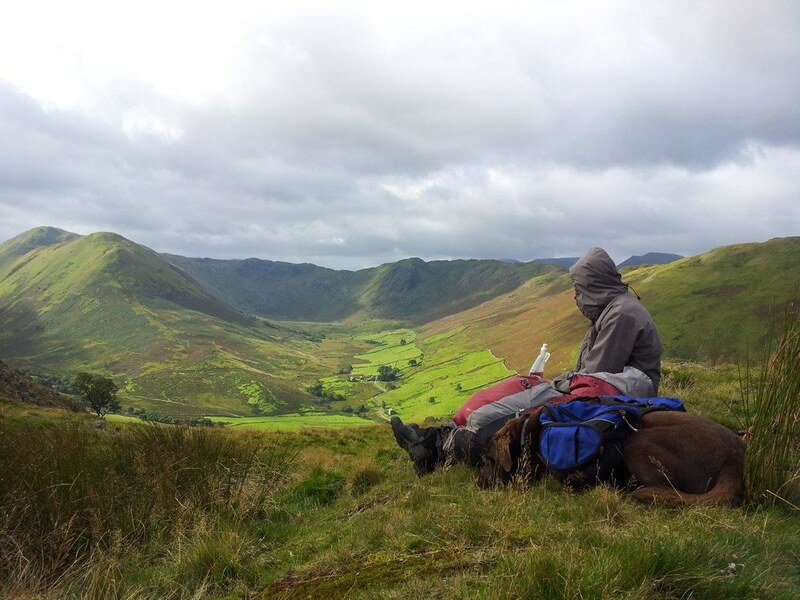 This makes completing the Wainwrights a feat of endurance and patience, but also one where an element of science and efficient planning is needed to get the most from each trip. The second point Tanya made was that she did around half of the 214 fells on solo walks. This is how I tend to walk too, but it seems I’m even less sociable than Tanya – of the 193 I’ve done so far only 13 did I have company for – so I’ve done 93% of my Wainwright walks by myself. Having got so many under my belt in billy-no-mates mode, it seems the thing to do to complete the full 214 that way. Not that I’m against company per se – indeed most of the ones I’ve done with others have even been with complete strangers (a guy I met in Wastwater Youth Hostel the night before the Yewbarrow-Pillar walk, and Peter who I arranged to meet for a wild camp before doing the Steel Knotts – The Nab walk). Got to redo this one too. Hitting both the no car and no companions criteria means redoing a total of 19 fells – 6 involving a car, 10 non-solo and 3 that fit under both headings. Just to be clear, I’m not saying that I have to fill both the no car and no company criteria in order to complete the Wainwrights, but rather that I see them as 3 separate milestones: firstly completing all 214 fells, then achieving the no car set then the solo set. To hit all 3 targets in one that means saving one of the 31 I’ve not done at all until the very end. Now 31 fells is just about doable next year, but if I expand that list to include all of the repeats too, then I’m on 50 which is well past the most I’ve ever achieved in one year (40). It’s more important to me that I complete the non car round so I’m definitely going to aim to complete the remainder of the 214 fells with no car use next year, then at some point after that I’ll redo those I had company for. Of course if it’s convenient to redo those that need doing solo earlier, then I’ll do so. But then again, the lure of the round number of 50 means I might try for the grand slam after all. Here’s the full picture of what’s left, including both those that need to be redone and those that haven’t been done at all. They’re coloured according to which volume of the Pictorial Guides they fall under. The other thing that’s been in my thoughts, at least until the decision to do all of these repeats formed, is what I do after I’ve done the Wainwrights. Specifically, will I do another round ? I’ve come to the conclusion that I’ll most probably just redo the ones I liked, and that attempting another full round would need a compelling objective in order to provide the motivation to do the less good fells again. I do have a couple of ideas, the most attractive of which is a single continuous round, but done in stages so that I’d do a chunk then on the next trip pick up at the exact spot I finished on the previous trip. I quite like the planning challenge that sort of round would bring. Still that’s a long way off – 50 fells off to be exact. Great blog. Good comparison and agree totally about the holiday planning etc. I have no desire to do another round of Wainwright’s – like you plan to I am returning to favourites and trying out some where the first time I was not blessed with views! Indeed. Whether I do a 2nd round or not, I’m definitely going to revisit some favourites and some which I suspect might become favourites if only the conditions had been better first time.